Train 262 from Hua Hin to Bangkok (Hua Lamphong Station) is and afternoon, Ordinary service, with just 3rd class seating available. If you want the cheapest way to get to Bangkok from Hua Hin, this is it. These Ordinary / Local train services offer only 3rd class seating, often in a range of old rolling stock / carriages. All carriages have ceiling fans (if they are working) to keep you cool when the train has stopped, and the open windows give you a nice breeze when the train is on the move. 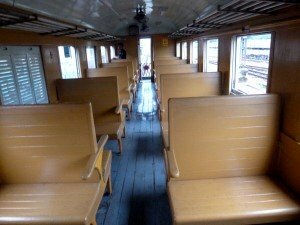 Seats can come in different varieties, from hard wooden seats coaches, to more comfortable padded seats, either arranged down the side of the carriage or in rows. The carriages can get crowded at times and there is always something to buy (drinks and food) from the vendors who work this route. As the train is the slowest way to travel to the capital, many people opt for a much faster minivan service, or a bus to the Southern Bus Terminal. 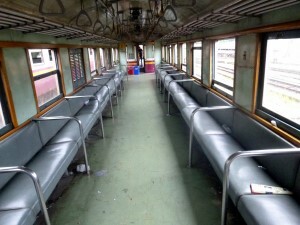 Tickets for Ordinary trains in Thailand are only sold on the day of travel. So if you want to take this train to Bangkok, just turn up at Hua Hin station around half an hour before the departure time, and buy your tickets then. Don't worry about the train being sold out, there is always standing room available when it is busy.